As a company we are committed to reduce our impact on the environment and to help other companies do the same. by investing in its development for almost 20 years. Our commitment to sustainable packaging was recognised with an Environmental Packaging award from the Packaging Council of New Zealand (Inc) in 2011. Our strong focus on innovation and environmentally-responsible packaging has resulted in the development of several high performance sustainable films. 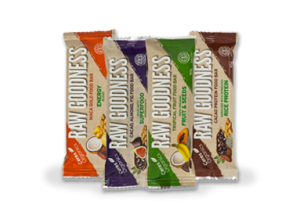 We understand that to be commercially viable, packaging has to offer good barrier and sealing properties, and needs to be robust enough to withstand production processes and distribution chains with minimal modifications. Our technical team will help you trial sustainable packaging from initial packing and sealing to the end of your supply chain to make sure it delivers the performance you need. Econic compostable packaging has been purpose-designed by Convex to allow eco-conscious companies reduce their impact on the environment while still retaining the same level of functionality and food safety provided by traditional plastic films. The majority of every Econic bag or wrapper is made from a combination of compostable films derived from sustainably-managed renewable resources. Find out more about Econic. If you would like to find out how we can partner with you to make your packaging more sustainable, please contact us now. 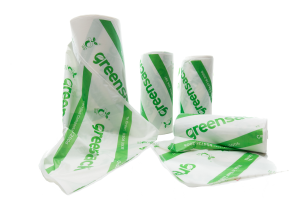 Greensack™ has similar strength qualities to Polyethylene. 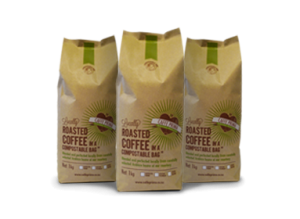 It is available as retail carry bags, singlet bags, indoor bin liners, and wheelie bin liners for food and organic waste collection.